Yesterday’s Land Use Committee at the Board of Supervisors featured 50 supporters of the India Basin neighborhood who want to landmark the Shipwrights Cottage at 900 Innes – along with representatives and backers of the Tenderloin Housing Clinic’s plan to build affordable family housing on the site. Clinic Director Randy Shaw spoke in support of landmark status, and the Supervisors were eager to support a “win-win” solution that would preserve the cottage and build housing. But some neighbors did not appear to support housing there at all – and a few reminded the crowd that the hearing was strictly about historic preservation. 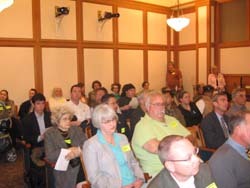 When the hearing got tense, Board President Aaron Peskin asked if a “violent agreement” can be possible: “if all of you can learn to hold hands and make nice, we can really get an exciting project.” The Committee voted to recommend landmark status for the cottage, while contemplating that it will be a mixed-use site with affordable housing. The Shipwrights Cottage at 900 Innes is probably the last Victorian-era workers cottage along the San Francisco waterfront – hearkening back to an earlier time in our City’s history when Hunters Point was a major shipbuilding center. The Tenderloin Housing Clinic (publisher of Beyond Chron) acquired the site last December, and plans to build a 200-unit apartment complex – with 50% of the units below market rate. Because the project would not be built with public funds, the developer can select who will occupy most of the affordable units – which will be current residents of Bayview-Hunters Point. If the cottage gets landmarked, the project’s size would be reduced along with an estimated 12 housing units. Shaw suggested moving the cottage to a waterfront location on the site, so that it could serve the community’s goal of turning it into a maritime history museum. But at the hearing, some argued that moving the cottage would be unacceptable. “It needs to stay where it is to retain its historical significance,” said David Tornheim. Everyone supports affordable housing, but the devil is in the details – and a few people at the hearing who supported landmarking the cottage didn’t seem to like housing on that site. Dan Dote said that a dense project would be more appropriate along a mass transit corridor (3rd Street), while another resident complained that the neighborhood already is “100% housing.” Jill Fox said that with Lennar’s plans to build 800 units at Hunters View and 1200-1600 at the Hunters Point Shipyard, “livability” was another important goal. Cheryl Schultz of the California Historical Society wondered why the Clinic would have a problem “because they’re only going to lose 12 units [of housing. ]” She also said that once the cottage gets landmark status, the property owner “will inherit a real goldmine.” At a time when the non-profit sector struggles to get any affordable housing built with diminishing public funds, twelve units would be a significant change to the project. And the Supervisors were eager to come up with a reasonable solution. Sophie Maxwell, who represents the area, repeatedly reminded the crowd that “this is not an either-or,” and Aaron Peskin agreed that affordable housing and historic preservation are not mutually exclusive. The Clinic supports a plan that would preserve the cottage exterior – while ensuring that enough affordable housing is built to address the dire need in Bayview-Hunters Point. The only question now is: will the preservationists back housing on the site, or was their concern for the cottage motivated solely by a desire to defeat potential development?